مخلص, فرنوش, کرامتی, احسان, نوذری, بهناز. (1394). منظر بزرگراه ارزیابی دو منظر بزرگراهی در تهران. 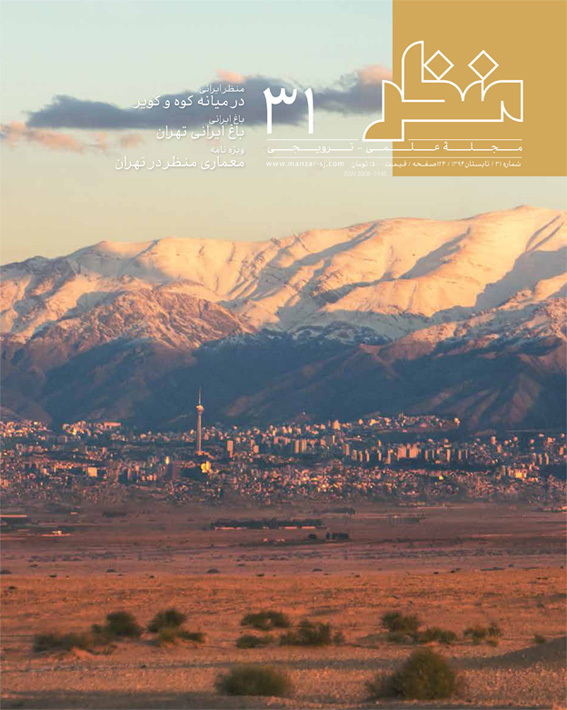 مجله علمی-ترویجی منظر, 7(31), 110-115. فرنوش مخلص; احسان کرامتی; بهناز نوذری. "منظر بزرگراه ارزیابی دو منظر بزرگراهی در تهران". مجله علمی-ترویجی منظر, 7, 31, 1394, 110-115. مخلص, فرنوش, کرامتی, احسان, نوذری, بهناز. (1394). 'منظر بزرگراه ارزیابی دو منظر بزرگراهی در تهران', مجله علمی-ترویجی منظر, 7(31), pp. 110-115. مخلص, فرنوش, کرامتی, احسان, نوذری, بهناز. منظر بزرگراه ارزیابی دو منظر بزرگراهی در تهران. مجله علمی-ترویجی منظر, 1394; 7(31): 110-115. بزرگراه‌ها به عنوان بیرونی‌ترین عنصر شبکه راه‌های دورن شهری نقش مهمی را در جابجایی و دسترسی شهری ایفا می‌کنند. از این رو پرداختن به چگونگی طراحی منظر بزرگراه باعث ارتقای کیفیت منظر شهری می‌شود. امروزه در خصوص طراحی منظر بزرگراه‌ها و جداره‌های آن در ایران ضوابط و مقررات مدونی وجود ندارد و فقدان طرح‌های بالادست که بر کیفیت طراحی و اجرای منظر بزرگراهی نظارت داشته باشند، باعث بروز اغتشاش در منظر شده است. توجه نکردن به همخوانی کالبدی این عناصر با سایر عناصر شهری و نیز توجه نداشتن به منظر آنها می‌تواند مشکلاتی از انواع زیست محیطی، اجتماعی و شهری را پدید آورد و عدم خوانایی بزرگراه‌ها برای زندگی شهروندان چالشی جدی محسوب می‌شود. با توجه به اینکه کاربری اصلی بزرگراه عبور ماشین‌ با سرعت زیاد است باید در منظر آن‌ها به عامل سرعت توجه ویژه شود. عناصر اطراف بزرگراه به نوعی نشانه تبدیل می‌شوند. به موازات آن هویت و زیبایی‌شناسی بزرگراه‌ها مطرح می‌شوند و نقش نشانه‌ها در آن عمده می‌شود. مکان قرارگیری بزرگراه‌های تهران با توجه به بستر جغرافیایی و ویژگی‌های طبیعی آنها بسیار با هم تفاوت دارند. منظرهایی که در این مسیرها برای مخاطب به نمایش گذاشته شده، ارتباط معنایی با ارزش‌های طبیعی و تاریخی زمینه بزرگراه ندارند و در محدوده وسیعی، جداره‌های بزررگراه با درختان سبز، طرح کاشت ریزدانه، ساختمان‌های بلند مرتبه و دیواره‌های بتنی حجیم در راستای تأمین امینیت حرکت، ساماندهی شده‌اند. تحلیل منظر بزرگراه‌های یادگار امام و شهید همت با رویکرد زیبایی‌شناسی نشان می‌دهد آشفتگی در آنها به دلیل کم‌توجهی به فرایند معنابخشی و نبود برنامه‌ای جامع در طراحی جداره‌های بزرگراهی منطبق با تاریخ طبیعی و هویتی در برنامه‌ جامع شهر است. Highways as the outermost element of urban road network play a significant role in urban transportation and access. Therefore, the way of dealing with highway landscape design will improve the quality of urban landscape. Nowadays, there exist no landscape design criteria and provisions of the Highway and landscape and walls in Iran and the lack of upstream plans to monitor the quality of the design and implementation of a highway perspective has led to confusions in landscape. Ignoring the physical consistency of these elements and other urban as well as disregarding their landscape can generate problems ranging from environmental issues to social and urban ones while illegibility of highways is considered a serious challenge for citizens. Considering that the main users of the highway pass with a high speed, special attention should be given to speed factor in highway landscapes. All of the highway elements are coded and highway landscapes are not exempt from this problem. In this respect, identity and aesthetics of highway arise out of context and history of a city. Tehran highways are situated differently according to geographical and natural features. Landscapes that are displayed lack semantic relationship with the natural and historical values of the highway context and are mostly organized by green walls over the highway with fine vegetation, high-rise buildings and large concrete walls to provide security in high-speed lines. Selected landscape with aesthetic approach in Yadegar-e-Imam and Martyr Hemmat highways demonstrates how disregarding of meaningful, identifying and aesthetic elements of design has transformed the highways to a traffic body associated with the operation of transport and connections of different parts of the city. Uniformity and ornamenting approaches and interventions in the body of the highway, with fine vegetation and high costs have caused readability independent path routing from identifying elements and beauty is rather added than perceived. Removing garden, hills, river valleys and the current aqueducts in Tehran and geographical and natural landscapes in the context of highways and replacing them with personification decreases legibility and harmony with the context and history. Proper communication between the ecological, natural, historical and contextual structures with aesthetical purposes with new structures such as highways can be an effective factor in environmental development and the future landscape of the highway and its surrounding areas.